Fans of Fujitsu's practical module bays will be interested in this compact and attractive 13.3-inch notebook. 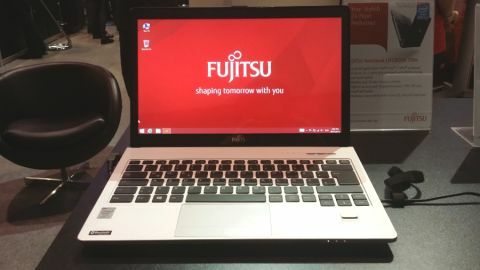 We recently got some hands on time with Fujitsu's compact Lifebook S904 notebook at VMworld 2014. The 13.3-inch business machine caught our eye for its sleek design and the company's claim that its battery can run for up to 24 hours before giving up the ghost. While we couldn't verify that claim at Fujitsu's booth, we were able to check out its design and other specs. Inside the model, which was running Windows 8.1 Pro, was an Intel Core i7-4600U Haswell CPU clocked to 2.10GHz (turbo boost to 2.70GHz) backed up by 8GB of RAM. It's also available with Intel's Core i5 chip and can be configured with anything between 4GB and 12GB of RAM. The S904's internals are wrapped up in an attractive design that's typical of the company's Lifebook models. The base and lid are made of a matte black plastic, while the keyboard and palm rest are coated in a metallic silver aluminium. A silver Fujitsu logo adorns the centre of its sturdy lid. The machine is chunkier than many 13-inch Ultrabooks but is fairly slim for a notebook that can be fitted with the rarest of components: an optical drive. Like many of Fujitsu's Lifebook machines, it's available as one of several modules and can be swapped out for a second hard disk drive. Alternatively, it can be exchanged for a battery module, which is where Fujitsu's all-day battery life claim comes from. The S904 features an attractive and bright IPS display that offers good viewing angles and responds sharply to touch. Fujitsu, sensibly, tends to opt for the 2560 x 1440 (QHD) resolution on its 13-inch notebook displays, and it's done so once again on the S904. It's a good fit for the panel's size and renders text and UI elements easily readable without having to alter Windows 8.1's manification settings. Connectivity-wise, the S904 features a VGA connection, HDMI, LAN and USB ports on the left-hand side, with the swappable module bay, power connector, Kensington lock slot and optional SmartCard reader housed along the right-hand edge. It can also be configured with a fingerprint sensor, TPM and ATP, and communication options can be extended via inbuilt 4G/LTE and extra peripherals can be hooked up courtesy of a port replicator. The S904 has a typically shallow Fujitsu keyboard that allows for fast typing courtesy of its well-spaced chiclet-style keys. In case Fujitsu's touted 24 hours of battery life aren't enough, or if you want to save yourself carrying around modules, the S904's back panel can be removed allowing you to insert a spare battery while on the road. The Lifebook S904 is aimed primarily at business users, and comes with an enterprise-class price tag to match. Starting at around £1,075 (around $1,729 or AUS$1,966) it spans all the way up to around £1,600 (around US$2,574 or AUS$2,926) for the top-spec model. We'll see whether it lives up to those wallet-thumping figures in our full review. A slightly bulky chassis doesn't detract from the Lifebook S904's charms too much. It's still attractive, and businesss users won't be too bothered about a little extra thickness to get hold of full day of battery life (we'd bet that plenty of consumers would make the sacrifice too). Add in a highly attractive 13.3-inch display with a sensible resolution and great viewing angles, a slew of configurable internals and a multitude of security options, and Fujitsu may have made a notebook that deserves its high-end price tag. We're hoping to get our hands on the Lifebook S904 soon to let you know for sure.